Freiheit's chairman, René Stadtkewitz, is flanked by other party leaders at the founding event. As a reminder of how freedoms have eroded in Europe in this age of Islamist terror, a political party that resists Islamization and supports Israel cannot come into existence in broad daylight. So, like the other 50-plus attendees, I learned of the event's time and location only shortly before it took place. For good measure, the organizers operated undercover; the hotel management only knew of a board election for an innocuously named company. 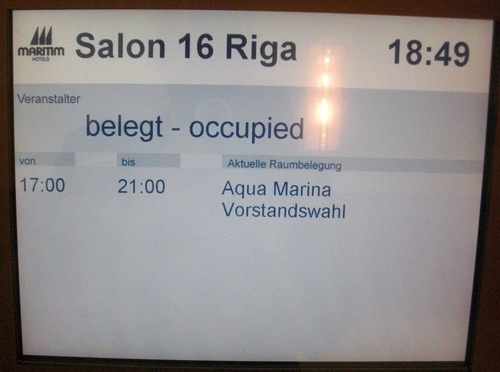 Even now, for security reasons, I cannot mention the hotel's name. 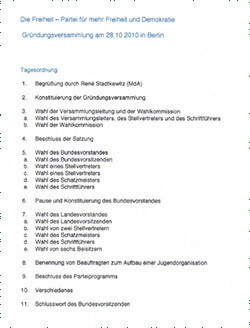 Much of the time was taken up with the legalisms required to register a political party in Germany: attendance was taken, votes counted, organizational procedures explained, steps enumerated to contest Berlin elections in September 2011, and officers elected, including the chairman, René Stadtkewitz, 45. Of East German background, he is a member of the Berlin parliament who belonged to the ruling conservative Christian Democratic Union party until his expulsion a month ago for publicly hosting the Dutch politician Geert Wilders. 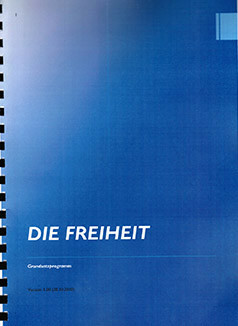 The cover of Freiheit's "Basic Program." For me, of chief interest was his oral summary of party policies plus the distribution of a 71-page Grundsatzprogramm ("Basic Program") setting out party positions in detail. Stadtkewitz explained the need for a new German party on the grounds that "The established parties, unfortunately, are not ready to take a clear stand but instead abandon the people to their concerns." The program neither minces words nor thinks small. Its opening sentence declares that "Western civilization, for centuries a world leader, faces an existential crisis." The new party, whose slogan is "the party for more freedom and democracy," speaks candidly about Islam, Islamism, Islamic law, and Islamization. Starting with the insight that "Islam is not just a religion but also a political ideology with its own legal system," the party calls for scrutiny of imams, mosques, and Islamic schools, for a review of Islamic organizations to ensure their compliance with German laws, and condemns efforts to build a parallel legal structure based on the Shari'a. Its analysis forcefully concludes: "We oppose with all our force the Islamization of our country." Freiheit robustly supports Israel, calling it "the only democratic state in the Middle East. It therefore is the outpost of the Western world in the Arab theater. All democratic countries must show the highest interest in Israel's living in free self-determination and security. We explicitly commit ourselves to Israel's right to exist, which is not open for discussion." However clear these passages, as well as the rejection of Turkish accession to the European Union, they comprise only about 2 percent of the Basic Program, which applies traditional Western values and policies generally to German political life. Its topics include German peoplehood, direct democracy, the family, education, the workplace, economics, energy, the environment, health, and so on. Offering a wide platform makes good sense, fitting the anti-Islamization program into a full menu of policies. Despite this, of course, press coverage of the founding emphasized Freiheit's position vis-à-vis Islam, defining it as a narrowly "anti-Islam party." The establishment of Freiheit prompts two observations: First, while it fits into a pattern of emerging European parties that focus on Islam as central to their mission, it differs from the others in its broader outlook. Whereas Wilder's PVV blames nearly every societal problem on Islam, Freiheit, in addition to opposing "with all our force the Islamization of our country," has many other issues on its agenda. Second, Germany is conspicuously behind most European countries with a large Muslim population in not having spawned a party that stands up against Islamization. That's not for a lack of trying; previous attempts petered out. Late 2010 might be an auspicious moment to launch such a party, given the massive controversy in Germany over the Thilo Sarrazin book ruing the immigration of Muslims, followed by Chancellor Angela Merkel announcing that multiculturalism has "utterly failed." A change in mood appears underway. The Freiheit party has been conceived as a mainstream, earnest, and constructive effort to deal with an exceedingly complex and long-term problem. If it succeeds, it could change the politics in Europe's most influential country. Nov. 2, 2010 addendum: For the significance of the emergence of Die Freiheit and other political parties critical of Islamization, see my 2007 article, "Europe's Stark Options," especially "II. Muslims Rejected." The 52 men and women meeting in a conference room at the Hotel Maritim in Berlin's Tiergarten district were determined to remain undisturbed. No one else was privy to the location and time of the meeting, in a deliberate attempt to prevent protestors and journalists from showing up at the scene. The only outsider present was Daniel Pipes, an American author, critic of Islam and advisor to former New York Mayor Rudolph Giuliani, who happened to be in the city. The Hotel Maritim is on Stauffenbergstrasse, near the Memorial to the German Resistance. It is an historic point of reference that the 52 attendees would likely have drawn encouragement from. Like would-be Hitler assassin Claus von Stauffenberg, after whom the street is named, they too hope to protect Germany against what they perceive to be pending disaster. The sign outside Freiheit Party's meeting room. It indicates a board election for something called Aqua Marina..
Mr Stadtkewitz said his party now had 1,400 members and was setting up regional branches across Germany. It plans to contest its first election in September when Berlin votes for a new mayor and city parliament. Mr Stadtkewitz said the aim was to cross the 5 per cent threshold needed to obtain seats in the assembly. "If that goes well, we'll prepare for the general election in 2013," he said. Political scientists have been saying for years that an anti-immigrant party could do well in Germany if it had a charismatic leader. It remains to be seen if Mr Stadtkewitz can assume such a role. With his melancholy eyes and soft, deep voice resembling that of a late-night radio DJ, he does not at first sight fit the description of a radical firebrand. But his quiet eloquence might enable him to attract the middle class voters he is appealing to. Mr Stadtkewitz was born in communist East Berlin, worked in a factory making industrial equipment and fled East Germany with his wife and son in September 1989, two months before the fall of the Berlin Wall. He returned to Berlin after German unification in 1990 and joined the CDU in 1995. In a sign that Freedom will face a struggle establishing itself, the party had to cancel its first congress this month because the language school that owned the venue withdrew its permission when it found out about the party's political leanings. So far, Mr Stadtkewitz has failed to recruit prominent Germans to join his cause, and even Mr Sarrazin has declined to join the party. "There is always the desire to tie in really well-known people, and I wouldn't be opposed to that," Mr Stadtkewitz said. "But I know we'll make it without them too." Dec. 4, 2016 update: Die Freiheit dissolved today. Its role has been more-or-less inherited by the Alternative für Deutschland, founded in 2013 and focused on immigration and Islamization issues since 2015.